Fixing or repairing chipped or cracked teeth. 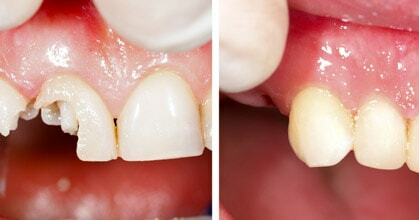 Reducing unsightly gaps or spaces between teeth. It is often used to improve the appearance of your teeth and enhance your smile. As the name indicates, composite material, either a plastic or resin, is bonded to an existing tooth. Unlike veneers or crowns, composite bonding removes little, if any, of the original tooth. It is a fairly quick procedure, which typically lasts less than one hour. Composite bonds, however, are not as durable and long lasting as veneers and crowns and may need to be re-touched or replaced in the future. It is important to remember that composite bonds stain more easily and therefore require proper care and regular cleaning. In order to ensure the longest possible duration of the bonding, composites should be brushed and flossed daily. It is best to minimize exposure to common staining elements such as coffee, tea, tobacco, foods and candy.